Use this printable complaint letter to notify a company that they have sent the wrong bill to the wrong person. 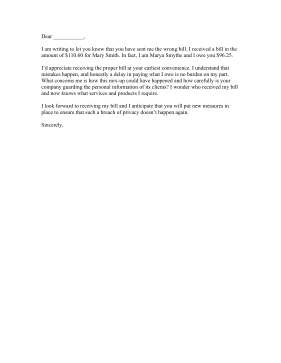 I am writing to let you know that you have sent me the wrong bill. I received a bill in the amount of $110.60 for Mary Smith. In fact, I am Marya Smythe and I owe you $96.25. I'd appreciate receiving the proper bill at your earliest convenience. I understand that mistakes happen, and honestly a delay in paying what I owe is no burden on my part. What concerns me is how this mix-up could have happened and how carefully is your company guarding the personal information of its clients? I wonder who received my bill and now knows what services and products I require. I look forward to receiving my bill and I anticipate that you will put new measures in place to ensure that such a breach of privacy doesn't happen again.